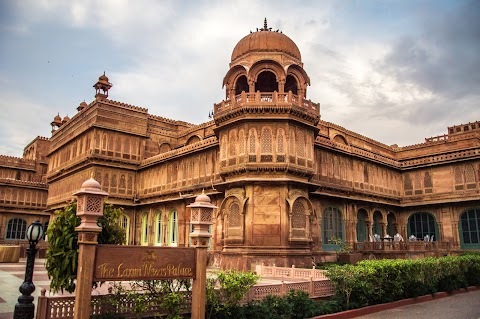 When I had talked to Khimji Meru, the owner of Rann Chandni Resort at Hodka, he was away to Bhuj and texted me the name of the attendant at the resort. However, I skipped it. When we reached Hodka, There was no mobile signal and the GPS had stopped working. There was a small shop selling handicrafts and cold drinks on the road. I asked the shop owner about the resort and Khima, he immediately called up the resort and soon a person appeared on his bike and escorted us to the resort. The resort was beautiful and was a newly built. 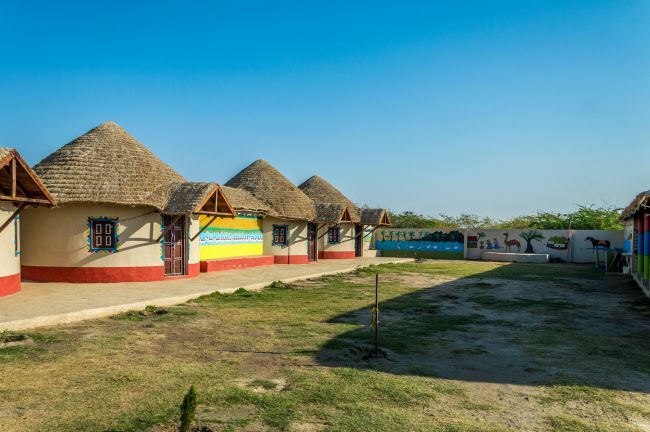 It comprised of traditional Kutchi style bungas with all the modern amenities. Since they had not prepared food, we had a lunch of Maggie, biscuits and tea. Initially, when we left Nirona, I called up Khimji to tell about our arrival and asked him to get the lunch prepared. I was slightly upset about Khimji telling me that he will not be able to prepare the lunch at a short notice, but later on realised that this place is so remote and there is no local produce and market so every single thing has to be hauled from Bhuj which is 60 km away. Anyways we settled in our room and were enjoying it and the environs. The resort was owned by an artisan's family and this showed. The walls of the resort were beautifully decorated with Kutchi art. Above is the picture of the interiors of the Bunga of our resort. The traditional style of Kutchi bungas was maintained. The floor was a Kutcha floor and even the bed was made up of bricks and mud, but was made comfortable witha thick mattress. 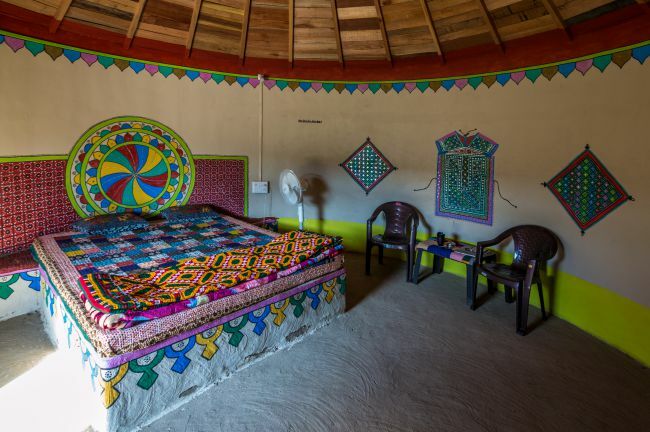 The room was beautifully decorated with traditional Kutchi designs and mirrorwork. Even the bed spreads were also traditional Kutchi style and hand made. 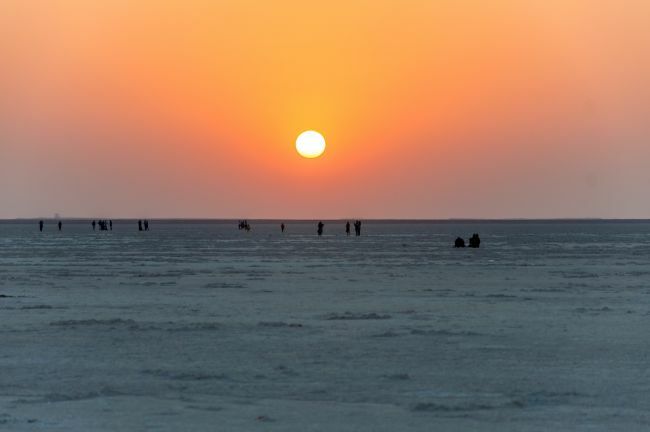 After lunch, tea and a bit of relaxing, we were again and road and this time we were going towards the highlight of the trip for which we had travelled so far “ The White Desert” and "Rann Utsav". 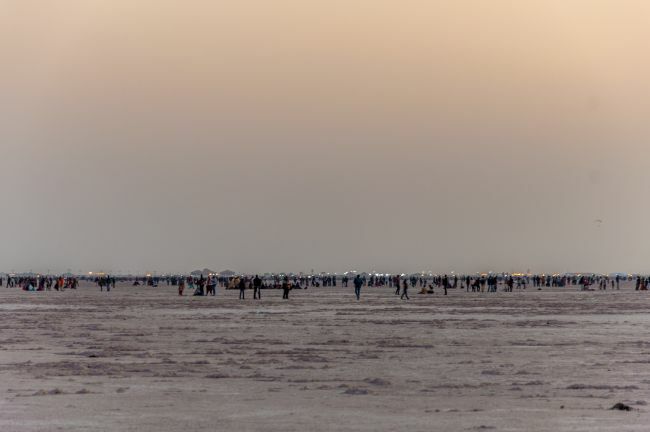 Rann Utsav is just 10 kilometres from our resort. 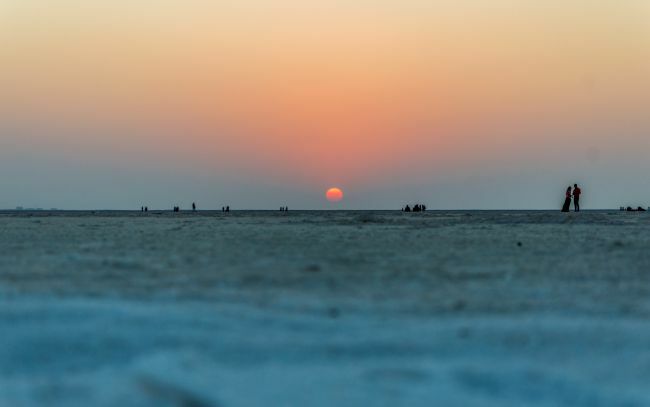 White desert is an arid area in Ran of Kutch. In Monsoon season, when it rains, this area becomes like an extension of the sea at the Gulf of Kutch. However, the water here is still and there are no waves. From July to October, this area looks like a sea. Post monsoon, the water starts to recede and dry up. 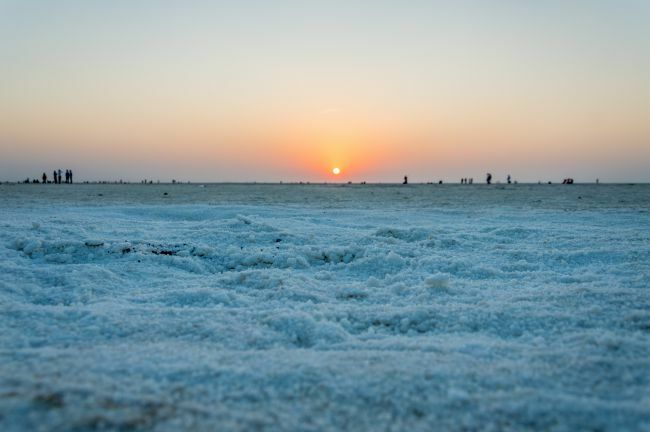 As November approaches, most of this water has dried up, leaving behind a white thick layer of salt giving birth to this beautiful salt marsh also known as white desert or Rann of Kutch. 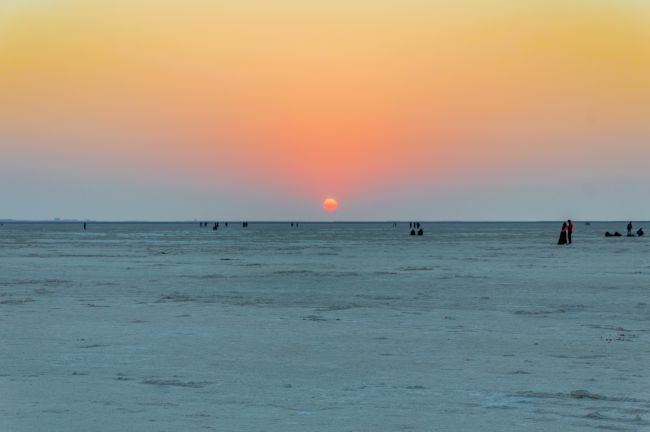 The rann of Kutch is 10,000 square kilometers and is divided into little Rann of Kutch and Greater Rann of Kutch. This is an arid area and not even a single strand of grass grows here. Till a few years back, the number of visitors in this area was so low that they could be counted on fingertips. The tourist infrastructure was non-existent. Then the Gujrat government focussed on promoting tourism to this magical place. Amitabh Bachchan was roped in to promote it and the tag line “Kuch din to Guzaro Gujrat mein” reached every household. 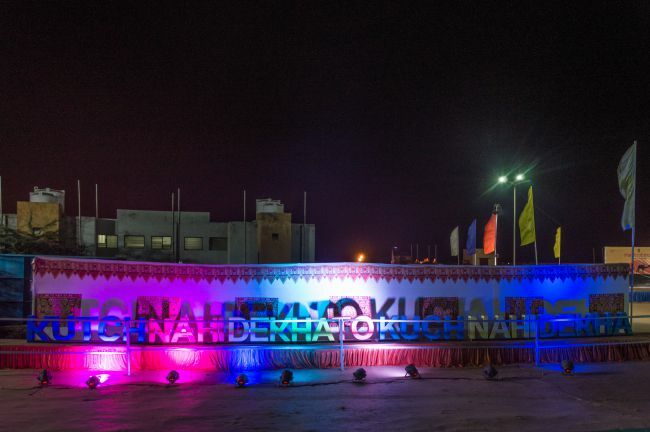 A festival to showcase the culture of Gujrat especially Kutch was started on the edge of the white desert at a village called Dhordo. This festival is held every year from October to March turning this salt marsh into a kaleidoscope of culture, colour, fun, cuisine and gaiety. A huge tent city with all the facilities and luxuries is set up at Dhordo. In spite of this being a government affair, it is very well managed and the things go butter smooth here. This has resulted in a very positive change in the economy of the people of this area. The government provides the subsidy to people like Khimji for making eco-friendly bungas or homestays. 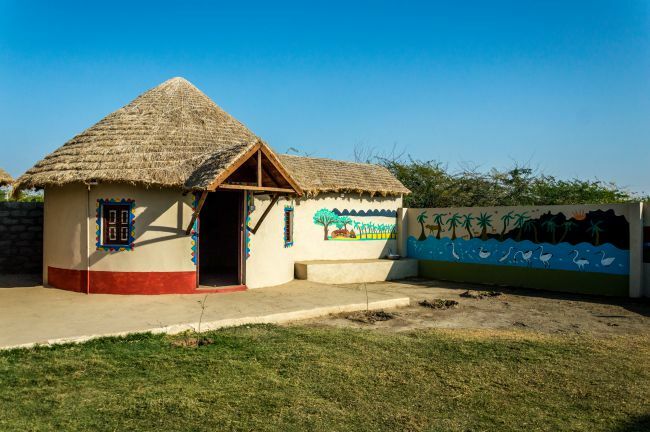 The stalls at the Rann Utsav are provided to artisans for a minuscule sum of Rs. 100/- per day. This helps them to earn handsomely and most importantly give them exposure. Today Khimji's family is selling their handicrafts to the stores in metros. 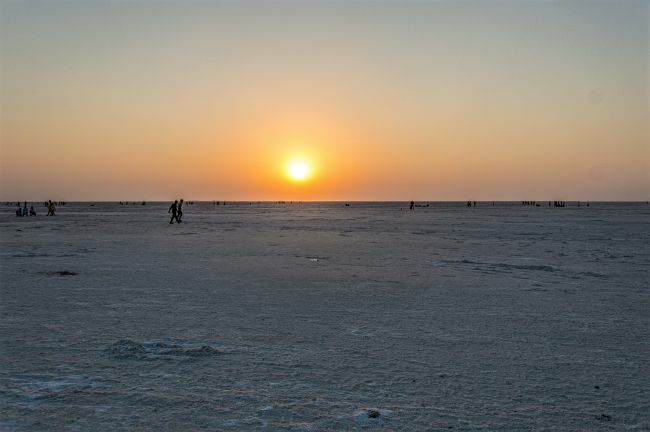 The road to Rann Utsav is very well maintained and passes through the arid landscape of Kutch. Inside the Rann Utsav area also, the things were well organised. Huge parking spaces. Very clean environs and the cars are to be parked nearly 2 km from the white desert. We parked the car, picked up our things and started moving towards the white desert. Our passes for the ROK were checked by BSF personnel and we were let inside on the road leading to the white desert. Actually white desert is on both sides of the road itself and the road leads to a watchtower. A variety of transports to the tower area were available which included camel carts, pony driven carts etc. We took a camel cart and it was fun riding them as the camel driver was racing with each other and the occupants cheering them. Camel carts ferrying tourists to the watchtower. 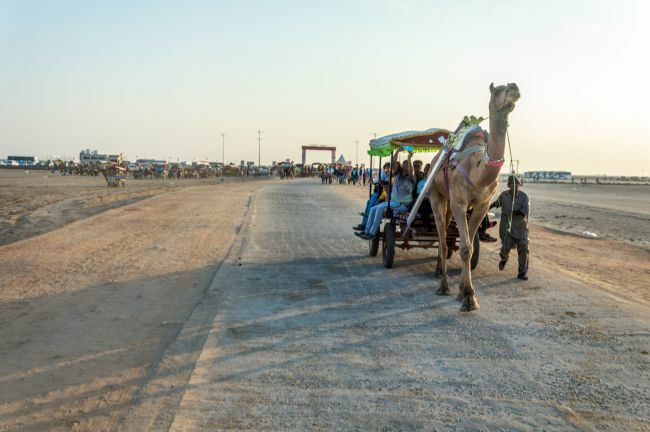 The above picture is that of the camel cars carrying tourists to the watchtower and in the background is the gate to the White desert. Vehicles are not allowed beyond that point and the passes are also checked here. Finally, we were there. The place which had fascinated us for so long. A vast expense of land all covered with salt. It was not as white as we had seen in the pictures. 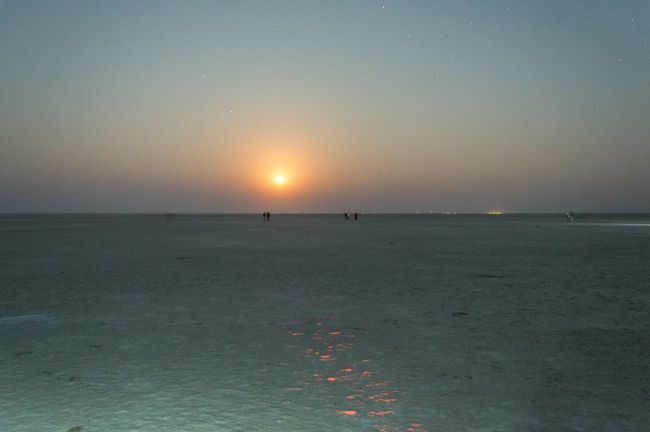 A Gujrat police personnel told us that since this year there were no rains, so the white crystal formation has not happened and the White desert looked like a solid sheet of salt as hard as a rock. Interestingly the watchtower has been made in the shape of a salt crystal. There was a lot of rush of the people on the tower and we also joined them. Anupma preferred to not to climb up. 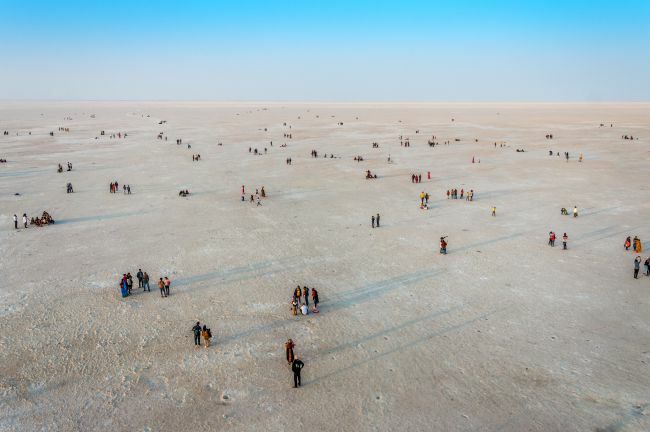 After a view of the vast expanse from the top and a few shots, me and Sarthak came down quickly and all of us started marching in the desert. Initially, there were a lot of people around. Just one kilometre into the desert and we had it all for us. There were no mountains no streams no trees for reference. Just the vastness a pinkish white blanket of nothingness extending to the Horizon. We did try some perspective photography and failed miserably. The sun was going down and it was so beautiful that I preferred to just look at it instead of clicking many photographs. We shot a timelapse of the sunset, which did not come out to be good as it was a borrowed Go Pro and I was not very conversant with the settings. Below is the Sunset Time-Lapse video. We spent some time watching people enjoying the white desert and occasional clicks. Sun had gone down now. Soon we were treated with another beautiful view. 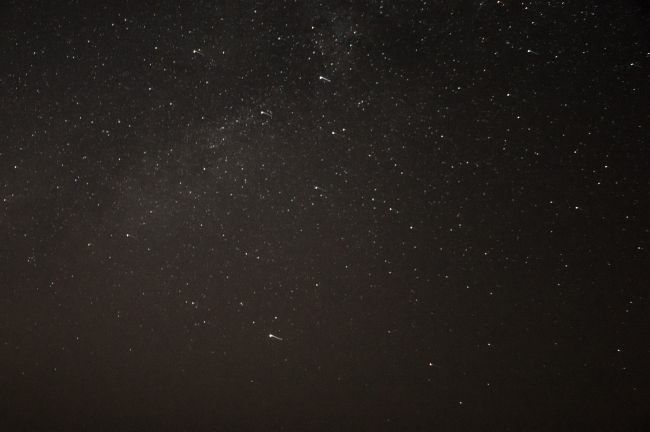 It was pitch dark and millions of stars had started to twinkle merrily. Mind games had begun. The first time we realised what pitch dark is. We were standing close to each other and still not able to see each other. And the stars up there made the atmosphere mesmerising. The desert true to its nature had become cold as soon as the Sun went down. It was very windy also. 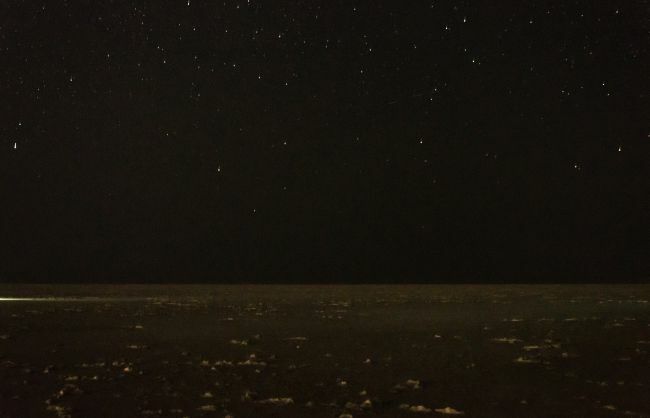 I can't explain the feeling it was a mix of abundance of joy with a pinch of fear, the joy of having seen the white desert, a beautiful sunset there, standing under the clear sky with millions of stars gazing at us and nothing around us except for the distant lights of Tent city for reference. If the tent city lights are switched off, one can easily get lost and maybe walk his way to Pakistan. The watchtower is the last structure in India till Pakistan border. 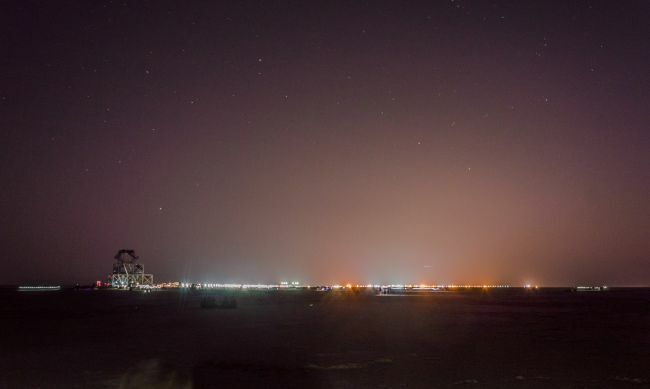 Anyways, after trying my hands on night photography and again failing badly, we started walking towards the watch tower as Anupma was feeling cold. We sat near the watchtower at a place, where a banner shielded us from the winds. I was comfortable here and we spent time chatting and Snacking. 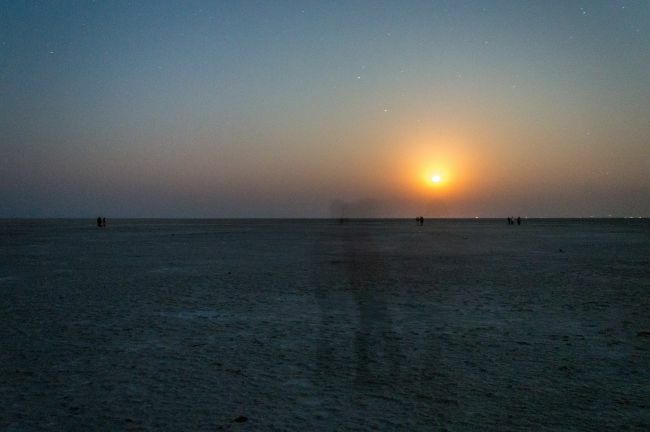 There were very few people left as most of the people had left after the sunset. The Vast Salt Marsh looked different after Sundown. 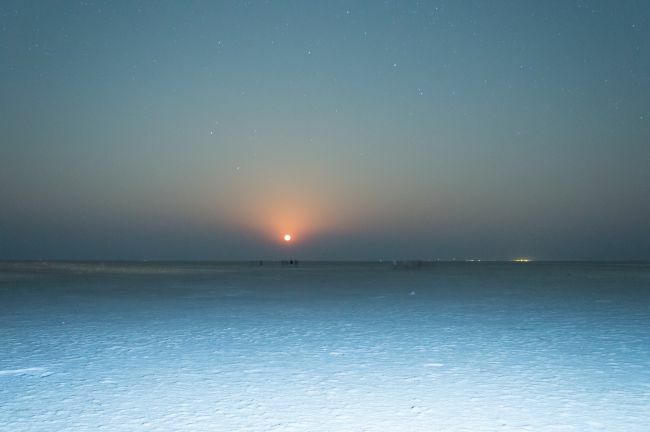 The Magic happened at around 8.30pm when a faint ball of red colour appeared on the horizon. It was the moon rise. I had never seen such a scene. It was pure magic. 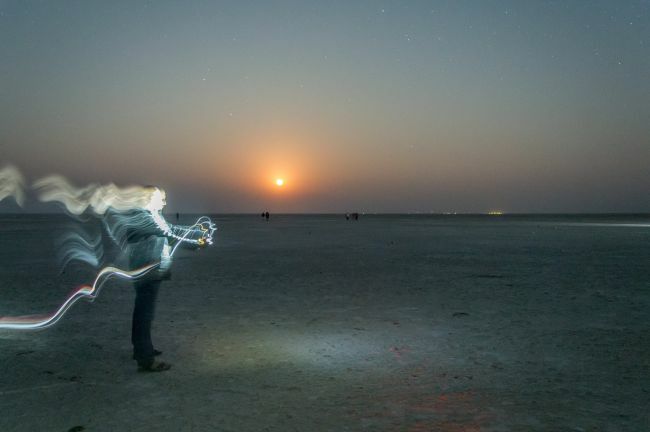 We walked back into the Rann. This time to a spot very close by to see the moon change its colour from very faint red to pale yellow. 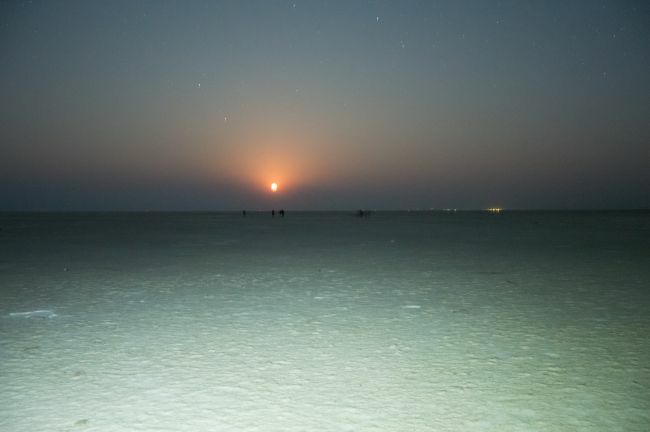 Now the moon was shining brightly and the entire Rann looked like a vast sheet of silver in the moonlight. It was a scene to behold. I have neither been blessed to explain that scene in words nor to capture it with my camera. We tried clicking a few shots the of the moon, but the photographs do not do even an iota of justice to the magic, that nature had woven over there. The moon changed colour colours and so did the surroundings. We had fun inducing some special effect in the images. A distant view of Test city with the white desert in front and on the left is the watchtower. I did not want to return and wanted to sit there and just stare at the moon and the surroundings. However, the cold and then the whistle from the BSF personnel to come out of the white desert made us pack our gears and return. Anupma and Sarthak again wanted a camel ride back to the BSF gate. I wanted the savour the scene as long as possible so I convinced them to take the walk back. The moon had turned from yellow to white with a hint of pale yellow. The vast expanse of white on both the sides with not a soul in there was mesmerising. This walk of 2 kilometres will remain etched in memory for long. We picked up our car and the came near the area, where food court and artisans' stalls were set up. We went through the stalls. Anupma liked a few things but we did not buy thinking that it would be costlier here due to Rann Utsav and having read somewhere that things were cheaper in Bhuj. Later we realise that this was a folly we committed. The prices were at par with Bhuj, but it seems that the artisans put their best foot forward at the Rann Utsav. The quality and beauty of handwork we saw at this place, we did not find anywhere during the rest of our trip. After bidding adieu to the Rann Utsav and the White Desert, we were cruising towards our resort. 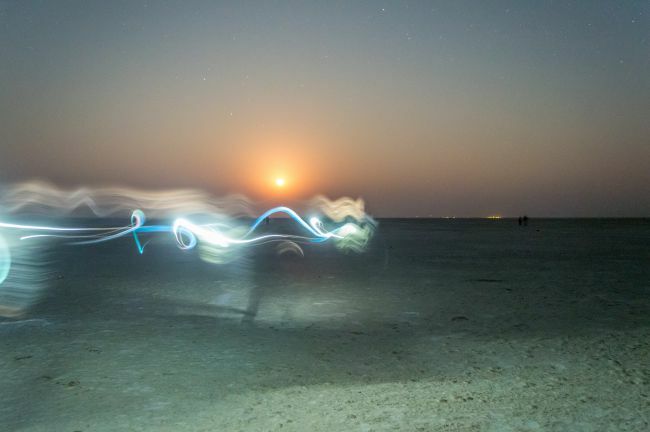 During the night there 10 kilometres seemed longer and finally, when we reached our resort, piping hot Kutchi dinner was waiting for us. After freshening up we had dinner and enjoyed the bonfire, which had been set up with cots around it. We sat there chatting and enjoying the environs as we were not bothered about getting early the next day. When it was quite late, we went to sleep with the memories of this magical land. Simply beautiful, loved this place.